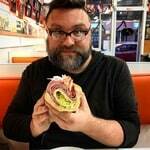 Jason Vowell is a writer, filmmaker, and food traveler. He lives in New Orleans and his dog is named after a sausage. People in the know have held close the few places that even attempt a decent dumpling. Secret's out. Grills smoking with pork and chicken and shrimp. Rice cookers steaming. The hiss of hot oil. Five taco trucks that regularly perch along South Claiborne, each totally unique in their offerings, sauces and surroundings. What to ease that post-Carnival parade route pain? Try these hangover slayer egg sandwiches. If cheesecake and king cake had a baby, this would be it.